Since the approval and marketing of Atlantis� in the Autumn of 2002 we have explored, monitored and evaluated its' efficiency across a wide range of situations. With blackgrass being such a problem and no one solution is ever black and white, the introduction of Atlantis� was a huge step forward. Since its approval we have carefully monitored its efficiency over a wide range of conditions and situations, such as soil type, time of spraying and soil temperatures. Cultural control methods have also been a key part in limiting both enhanced metabolism and target-site resistance becoming a common part of the blackgrass population. 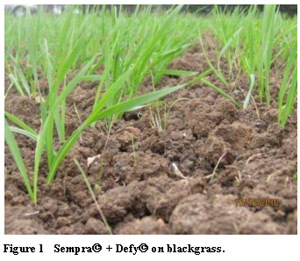 Continued use of a good rotation, mixing Autumn and Spring crops, full use of breakcrops so that different chemical families can be used across the rotation, ploughing, stale seed-beds and applications of glyphosate have all played their part in reducing the selection pressure on the blackgrass population. We have no target-site resistance where this approach has been adopted over many years. In some situations it is now becoming apparent that target-site resistance is appearing where predominantly cereal chemistry has been the sole defense strategy for blackgrass control. Before Atlantis� became available we had to use a mixed programme of chemicals starting with Merit� (IPU & simazine), which was followed by an application of Lexus 50 DF� to control any remaining survivors. After 3-4 years it became evident in some situations that this did not always give 100 percent control and then we would over-spray with Topik�. We were also trying various crops in the rotation such as winter beans, which were drilled later and ploughed in, which help in the overall strategy to reduce blackgrass resistance selection. We lost Merit� as a product and moved to Graduate�. When applied before the grass weeds emerged, this did a good job and could provide us with around 70-95 percent control of blackgrass, annual meadow grass, Italian rye grass and ABLW�s. Graduate is no longer available and is being replaced with a combination of chemical families. We then use Atlantis� as a follow up at early growth stage of the blackgrass, timing it to hit the most resistant population early, regardless of calendar date. This means application and timing will range from November to early April. As long as the blackgrass was capable of growth in the prevailing soil conditions and providing that the application was on to a dry leaf which could be well covered in chemical this, provided us with good control. The speed of effectiveness was changed with prevailing soil temperatures in as much as cold soils certainly slowed efficacy down but still achieved optimum control. This strategy has helped us to keep the costs down yet achieve a high level of control. What seems to be increasing now in many fields is the percentage of resistant plants in the blackgrass population. It became clear that the pre-Atlantis� blackgrass treatment has to be more effective, leaving the Atlantis� to continue to act as a final clean up against a low population of survivors, the timing of which, will be determined by the degree of success of the first spray and not as previously thought, the calendar date or soil temperature. We noticed again and again in our early observations that timing and coverage of the target were more important than soil temperature. 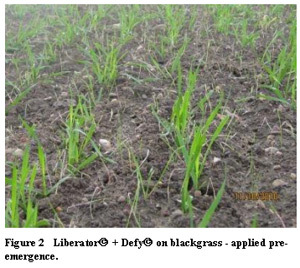 Application of the product onto a small resistant blackgrass and covering the target with as much chemical as possible are key factors for good control. By achieving a high level of control with the pre-Atlantis� treatment means that only a small amount of the blackgrass population is exposed to the selection pressure from the Atlantis�, protecting its future use. Although we do not work for Bayer or sell products, we are in a perfect position to give an unbiased view. J K Senior & Sons are grateful for the amount of research work done by Bayer over many years, looking at all the parameters, which help in the successful battle against the black grass problems faced by many growers across the UK. The issues surrounding soil temperature are still to be considered but it falls lower down the scale of concerns.